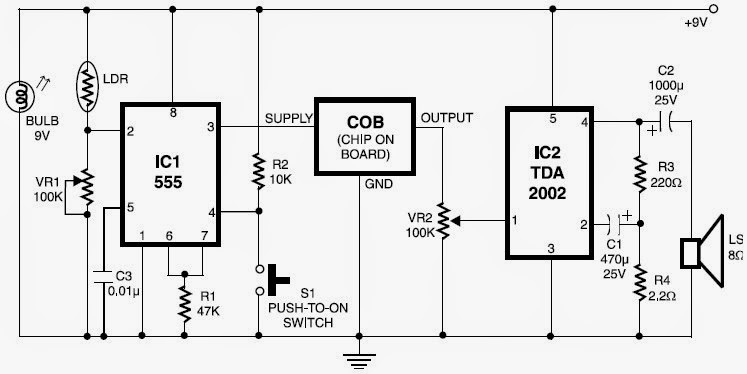 This is a Electronic Alarm Circuit Project of Fire Alarm with LDR Sensor. The fire alarm circuit which use LDR to sense the smoke from the fire, so it can be used to detect any dark smoke. With the onset of summer season, possibilities of fire accidents go up. These fire accidents could be prevented if timely alarms are available. The circuit given right here alerts the user against these fire accidents. The circuit needs to be put in fire-prone locations for example a kitchen. Every person is aware that when everything catches fire, smoke is produced. When this smoke passes between a bulb and an LDR, the amount of light falling on the LDR reduces. This causes the resistance of LDR to raise and the voltage at pin 2 of IC 555 comes below 1/3 Vcc. thus triggering IC 555 that is utilized right here in bistable mode. As a result the voltage of pin 3 goes high. This high voltage (about 9V) completes the supply to the COB (chip-on-board). Various COBs are available in the market to produce various sounds. Even so, one may choose a COB which produces sound for example ‘aag lag gai hai’. The signal produced by COB is amplified by an audio amplifier. In this circuit, the audio power amplifier is wired close to IC2 TDA 2002. The sensitivity of the circuit is dependent upon the distance between bulb and LDR as well as setting of preset VR1. Thus by putting the bulb and the LDR at proper distances, one may vary preset VR1 to have optimum sensitivity. Reset switch S1 is provided in the circuit to switch off the alarm soon after the fire has been found by the user.